Lucky Leaf provided me with products, at no cost, for the purpose of this blog post. All opinions expressed herein are my own. I might have found a favorite pie filling. The Lucky Leaf Peach Pie Filling I used for this cake is absolutely delicious. It's so good, that we snuck a little right from the can, before adding it to the cake. 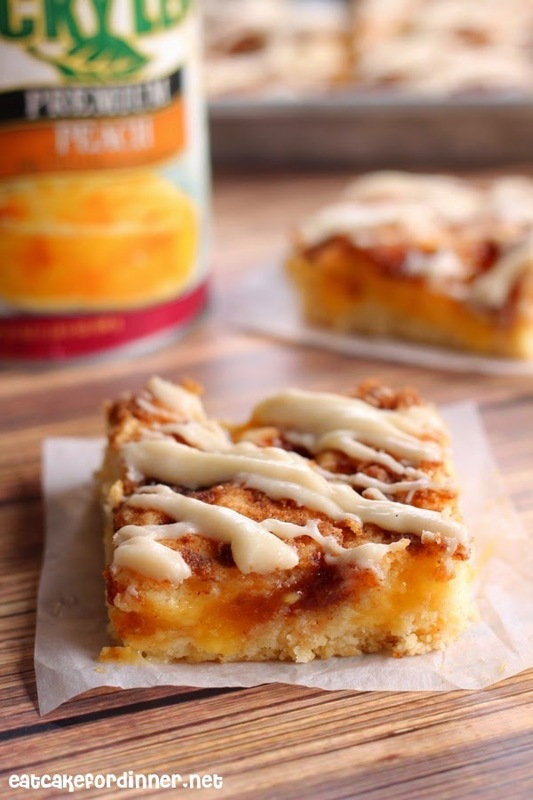 The flavor is perfectly peachy with just enough sweetness. It took my sheet cake bars to a whole new level. Peaches, Cake, Cinnamon Streusel and Cream Cheese Icing, what more could I ask for! The texture is cakey, but you can pick the bars up and eat them without needing a fork, which makes them such a great Summer dessert. Not a peach fan? No problem, you can make these delicious bars with any type of pie filling. Cinnamon and fruit go so well together, so Blueberry, Raspberry, Cherry and Strawberry would all be amazing. 1 c. unsalted butter, room temp. Preheat oven to 350 degrees. Cream together butter and sugar. Add the eggs, one at a time, beating well after each addition. Add the vanilla. Add the baking powder and flour and mix until just combined. Spread a little more than half of the cake batter into a greased 13''x18'' jelly roll pan. It might seem like there is not enough batter to cover the bottom of the pan, but it will. It will be a very thin layer, but it puffs up while baking. Spread pureed pie filling over the top, then drop spoonfuls of the remaining batter randomly over the top. Spread out slightly, but there should be many spots without any batter. For the Cinnamon Streusel Topping: In a small bowl, combine brown sugar, flour, cinnamon and salt. Add the cold butter and using your clean hands, rub together the dry ingredients with the butter until is resembles coarse crumbs. Sprinkle over the top of the cake. Bake for 33-35 minutes or until a toothpick inserted comes out clean. Cool completely. For the Cream Cheese Icing: Place cream cheese in a microwave-safe glass dish and microwave for 10-15 seconds or until very soft. Add the powdered sugar and vanilla and stir until smooth. Add milk, as needed, to reach adesired consistency. Drizzle over cooled cake. These have to be super delish! Pinned. Totally delish!! Thanks for the pin! Oh my goodness, I could eat the whole pan of these! I not only love peaches, but this looks easier to make than the standard pie! Oh yeah, much easier than an actual pie! Thanks, Leslie! You could try this peach filling of Sally's, but you would have to double or triple the recipe. How did you know I just pulled out a bag of frozen peaches from last season from my freezer? I needed the freezer space and it's time to use them up. This may be the recipe! Looks delicious! Wow, three layers of perfectness! 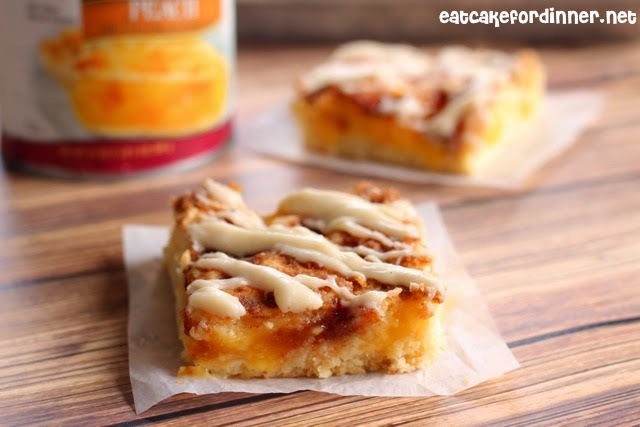 These peach pie sheet cake bars look so good! My boys will love these. I have to try it soon - pinned!! These look wonderful! I cannot wait to try these out =) Pinned! These bars look absolutely scrumptious Jenn! So perfect for summer! Pinned! Does the peaches come pureed? Hi, they come in chunks and then I pureed in the food processor. You don't have to puree them, if you don't want, but I'm not a huge fan of chunky fruit. I like it pureed.